See for Soldering Irons, Jigs, Fixtures and related tools. Is probably the most versatile of our solder pastes. It will solder most ferrous and non-ferrous metals including copper, brass, bronze nickel, platinum, (some) chrome, monel, galvanized, (some)stainless, gold, silver, coated steel, cast iron, black steel, steel. Silver Solder-It is extremely conductive because of its silver content. It produces extremely strong joints (5 to 10 times the strength of 60/40 solder) because it contains NO LEAD. Because of its low flow temperature, you can solder small jobs with the heat from a match or lighter. It is particularly useful for electrical connections, board work, connectors of all types (especially PL259s & "N" Connectors), miniature connectors, battery pack connections. For Model Railroaders, it solders rails without melting the plastic ties and is great for detailing because you can make multiple contiguous joints without disturbing the previously soldered joint... Yup, the first doohickey won't fall off as you are soldering the second one right next to it! 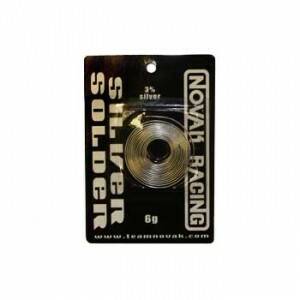 Novak solder bearing 3% silver. 6 grams. Lead free. Solders containing silver are lower resistance than standard solders. Use for electronic and mechanical puposes. Novak solder bearing 3% silver. 15 grams. Lead free. Solders containing silver are lower resistance than standard solders. Use for electronic and mechanical puposes. Flows at 395F far below the melting point of aluminum. It is used to solder many types and gauges of aluminum as well as to solder aluminum to most other metals. It is especially useful for joining dissimilar gauges of aluminum. Use Aluminum Solder-It for aluminum tubing, aluminum antennas, aluminum radiators, air conditioning condensers, refrigeration, aluminum boats, doors, windows, anodized aluminum and aluminum foil. 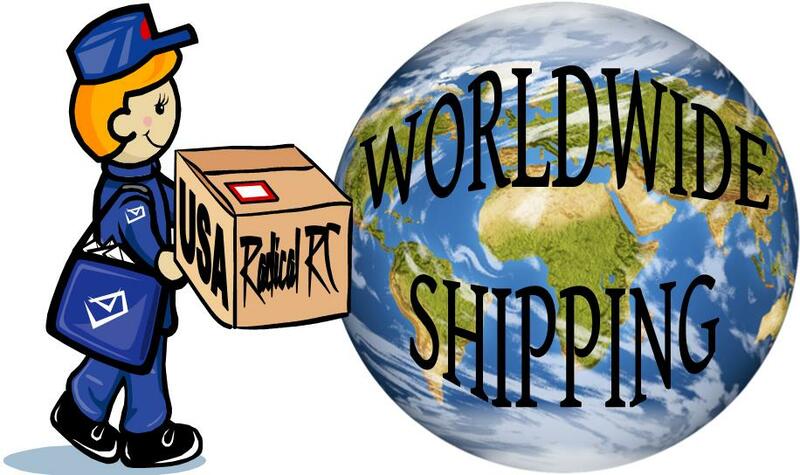 Great for constructing and repairing Remote Controlled Aircraft Parts and cosmetic repair of Homebuilt Aircraft/Parts. 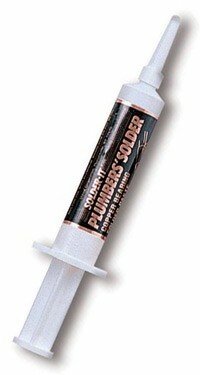 Formulated for heavy duty soldering of heavy metal parts. 5 times stronger than ordinary solder, 10k to 25k tensile strength. Better choice than lead based solders for custom landing gear construction. Flows smoothly at 430 degrees. Works with any open flame torch such at propate and butane. Contains no lead, cadnium or antimony Stress and vibrations resistant. Contents 14.7g. "Weld" many plastic parts. Designed for automotive uses but many uses in RC too. Heat activated, one part epoxy. No mixing, no measuring. Comes in syringe applicator. 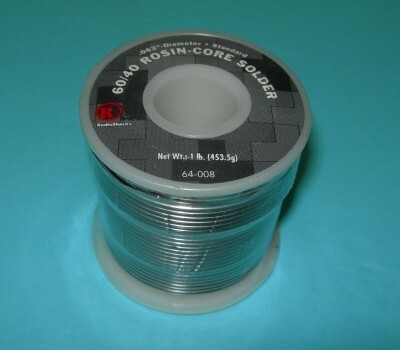 5 Foot section of rosin core electronic solder. Same solder we use in our shop. OD .065" (1.2mm), Length 137.75" (3.5m). 60% tin, 40% lead. 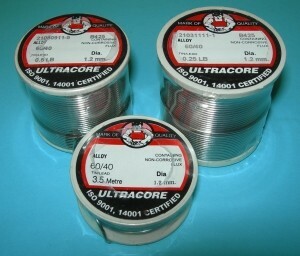 I've sent people to purchase this brand solder for years, now we have it in stock. OD .062" (1.57mm), Net Wt. 1lb. 60% tin, 40% lead. If you want to be sure you'll have real solder (not the junk lead free enviromental wacko crap) that flows and produces nice bright joints, get a whole pound now. It's continuing to get more difficult and expensive to obtain. Before sending me an email about the dangers of lead poisoning and children, be sure to include pointers to a few cases of children being poisoned by eating circuits and wires. Heck, I'll even accept one case if you can find it. I reject the emotional ploy of potentional lead poisoning in children from eating circuits and wires. It's non-sense and junk-science. Little Johnny: "I've got a ringing in my ears......" Dad: "Oh, Johnny, don't tell me you've been mixing capacitors and coils again!"